Home » barn education » Attend The Annual Conference! Joint Conference with the Friends of Ohio Barns. Join the Friends of Ohio Barns for their thirteenth annual conference in collaboration with the National Barn Alliance! It will be an entertaining and informative conference and barn tour on April 27th and 28th, 2012 in Summit County, OH. Summit County is home to the Cuyahoga Valley National Park and the Cuyahoga Countryside Conservancy Program. Homebase for the conference is the Clarion Inn & Conference Center (240 E Hines Hill Rd, Hudson, OH 44236; phone # 330-653-9191). The barn tour will include some of the barns in the conservancy as well as learning about the program from Darwin Kelsey Executive Director of the Cuyahoga Countryside Conservancy Program. Founded in 1999 as a way to rehabilitate old farms and put them back to work under the guidance of the Conservancy. It has been a very successful program on many levels and Mr. Kelsey will have a lot to say on the subject. We also have a panel of farmers from the program, including Alan Halko,Daniel Greenfield and David Wingenfeld, to talk about their experiences and how they fit into the Conservancy Program. The Keynote Speaker will be Scott Carlson, timber framer, woodworker, and craftsman extraordinaire. Although Scott would say, “I’m just a simple carpenter” you will find that is not the case after seeing some of his work. 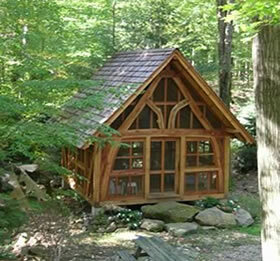 Scott graduated from the University of Montana as a forester, which has immensely helped him in the woods to find just the right trees to craft his cruck frames. We are thrilled to be able to have him take us on a journey from “Tree to Frame” on Saturday at the conference. History buffs will thoroughly enjoy David Snider from Somerset, Ohio. His topic for the conference is titled Agricultural Juggernaut: “The Jeffersonian Agrarian Vision meets the best damned farm ground on God’s footstool”. David is from a long line of barn builders, lumbermen and Ohio pioneers. He is a graduate of Hocking College and Ohio University and works as a modern agricultural structure designer/builder. He is a past president and trustee of the Perry County Historical Society and an unreconstructed devotee of early Ohio History. A must see presentation. Of course the conference would not be complete without the Barn Detectives, Rudy Christian and Larry Sulzer. They will be available on Friday’s tour to point out unusual joinery and well as present their findings at the conference on Saturday. The annual member meeting will be conducted during the lunch break and the silent auction will be ongoing all day as well as other exhibits, demonstrations and vendor presentations. You can register online or send in via mail. Not a member yet? Become one! Friends of Ohio Barns or National Barn Alliance!